Brown Safe created this $6,500 custom-designed safe for a customer who needed to protect piles of gold bars, jewelry and cash. 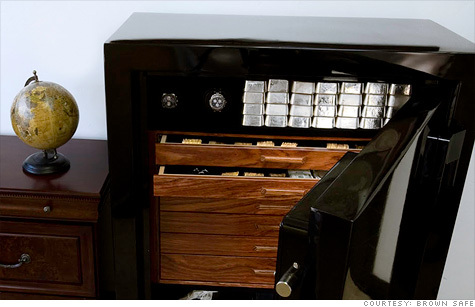 NEW YORK (CNNMoney) -- Amid the market turmoil, sales of security safes and vaults have spiked. While some shoppers sought to protect whatever valuables they had left, others needed a place to stash their newly-acquired safe haven assets such as gold and cash. Port Charlotte, Fla.-based Value Safes said it sold an average of $13,000 in safes a day in the past week, more than tripling its daily average of $3,500 from the previous week. On Amazon.com (AMZN, Fortune 500), SentrySafe's $170 1.2-cubic foot combination safe was among the site's biggest "movers and shakers" Friday, with sales rising 44% over the past 24 hours. Maximum Security, which sells safes for jewelry, coins, guns and other valuables, said it has seen demand climb by more than 30% over the past two weeks. "People are just plain scared," said Nancy Bryan, owner of Santa Ana, Calif.-based Maximum Security, who noted that sales started increasing about three years ago at the onset of the recession. "What is happening to our financial markets is the most recent addition," she added. "Folks are worried about the decreasing value of the dollar, burglaries on the rise in their neighborhoods ... and even the possibility that the unrest we are seeing in other parts of the world slipping over to our country." Even though the ailing economy has forced many consumers to cut back, they aren't skimping when it comes to protecting their valuables. Brown Safe has seen sales of its high-end safes and vaults, which can run from a small $450 wall safe to a $120,000 custom armor luxury safe, rise 38% in the past three weeks. Its ultrasuede-lined "Man Safe," which ranges from $6,000 to $8,000, comes with up to nine watch winders and is one of its higher-end models. Brown Safe said many of its customers have been making purchases over the past few weeks because they no longer trust their banks and are uncertain about stocks. Payson, Utah-based Liberty Safe said the 26% year-over-year spike in sales of its $900 to $5,000-plus safes over the last three weeks was also a result of the riots in England and other uprisings around the world. Prestige Safe has seen sales shoot "through the roof." Most of the recent demand has been for its high-end, maximum security products, said president Robert Tompkin. So far for the month of August, the company has sold 35 luxury safes compared with 20 in June and 25 in July. The luxury models include safes like the "Jewel Vault," which can endure two hours of fire and the "most severe attack conditions." Safes such as these are used to protect watch collections, diamonds, jewelry or gold and other precious metals, said Tompkin. "People haven't taken security as seriously as they are now," said Richard Krasilovsky, president of New York City-based Empire Safe, which carries both simple and luxury jewelry safes and bullion vaults ranging from $2,000 for an ordinary safe to over $150,000 for a customized vault. "Before now, people had the money to replace valuables they lost -- but today it's like, 'Oh my God, I just lost everything I had left,'" he said. Desperate times typically lead to an increase in theft, he added, and wealthy consumers are more likely to take measures to protect their valuables from burglaries and even previously trustworthy housekeepers. While Empire's sales have already increased more than 20% in the past week, he said the biggest increases are yet to come. "Sales don't surge right away with something like this," said Krasilovsky. "It's like a tsunami -- when you see the waves coming, you're freaking out about so many things that it's not until a little later that people have time to register what happened -- and then we'll start getting really slammed." Doomsday bunkers for under $10,000!